On the weekend of 26-28 October 2018, Rachel’s Runners took two teams along to Glenworth Valley on the NSW Central Coast to run in the first ever Australian Ragnar Trail Relay event. We went in with way too much camping gear and no expectations of what lay ahead, apart from a great weekend of running. Our campsite village housed both teams, and although we had a bit of friendly rivalry, we lived together as one for 2 nights and one very long day. 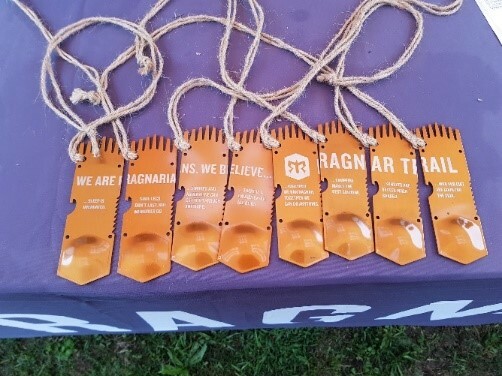 In the first of a 2 part blog series, Team A member Craig, takes us on his journey through Ragnar. Wow, what a weekend! As I sit and write my reflection on what was one of my favourite running events ever attended, I still feel just that little bit drained of energy and can think of so many moments over our 40 odd hours at Ragnar. The highs, lows, port-a-loos, horse poos and other various smells (some we still don’t know what they were or where they came from), and animal noises we never thought existed in Australia, but in the end, we would all sign up again tomorrow, as this event brought so much out and gave so much in return. The biggest thing to come out of it for me, was “being part of a great team” of dedicated runners. We were all individual runners, keen to do our bit and then effectively slapped together into two teams of 8 runners; some who we had not met and some we knew little of. Two captains were nominated and took the lead admirably – Sheree and Layla. And before I forget, we must thank them immensely, for their dedication and leadership, with planning and co-ordination of both teams throughout the lead up and the event itself. The constant barrage of messenger questions and planning ideas leading up, could have been enough in itself for a mini-series script for both teams! Mid Friday afternoon 26th October, 62 various teams began arriving at the picturesque Glenworth Valley; 40 teams of 8 people and 22 teams of 4, to take on the challenging 200km. Three trail loops to tackle and conquer – Green 6.20km, Yellow 7.60km and Red 10.50km. Competitors still trying to understand: How this will all work? When will I need to run? Which way do I go? Will I get lost? We got in and began to set up camp and check in; collecting our t-shirts, race bib and also some free give-aways of Endura energy bars and hydration from the Ragnar Village. Whilst we unfurled tents and gazebo’s without any written instructions (who needs them anyway? ), we used good old grey matter and put them together like jigsaws, managing to get most of the pieces together correctly to create a little makeshift Rachel’s Runners Ragnar Town. Team A had a little Christmas at Ragnar theme going on and a refreshing pool out the front with lots of solar lights and tinsel highlighting various tent ropes and pegs. The eskies were full of ice, water bladders, protein drinks, protein bars, chips, slices, banana bread, fruit cake and much, much more (not to forget red snakes too). It was then on to enjoying dinner and whilst some enjoyed the pleasures of home cooked and others sampled one of the two vendors selling food in the village – fresh pizza or Dairy Extraordinary, where you could get melted cheese on virtually anything – burgers, fries, chicken schnitzel – you know all that stuff that’s good for fueling the body whilst running through the bush?! Whilst we briefly enjoyed the Kumbaya moments and the sounds of the bush after dinner (we were sipping on various beverages including several small sippets of red wine, coke and me with a little scotch) and taking in the typical smells associated with the bush life, we soon also discovered that when camping by a creek, the illuminating essence of Aeroguard No.5 in an attempt to fight off the attacking mozzies who came in to enjoy the feast also, becomes a familiar (and welcome) fragrance. Bedtime was early for most as we had a long day and night in front of us and with everyone looking forward to the event in anticipation, sleep was key to any success. Everyone retreated to their tents, swags and sleeping bags for the night ahead. Well, a peaceful night you would think we’d have in the Glenworth Valley…hardly! There were birds and other animals in that bush that could wake the dead, the constant woot-woot of owls about and we were also sure there were crocodiles in the creek chasing prey as the noises continued, not to mention the bang of the inconsiderates, letting go of the portable dunny doors in the middle of the night, Big plastic spring-loaded doors, don’t shut gently when let go from 20 feet either! I think that was their plan! Before we knew it dawn was upon us and Richard and I readied ourselves for the 8am start for the second wave of 9 waves to get away every 30 minutes. Nervous energy electrified our muscles and we moved into the transition tent where we were introduced by the Ragnar Team as “Superstars” as we jogged up to the start line assembly – quite a thrilling moment to be part of. BANG – and we were off, busting out of the blocks! I took off like a gazelle to clear the pack and utilise the nervous energy, to then hit the dreaded long thick grass, and as we were only the second set of people to hit this grass it was still up around our knees and this went for about 800 metres – by that stage you knew you were heading into a difficult trail. This was the green loop trail and supposedly the shortest, but from all accounts ended up being probably the technically hardest. It travelled up and down with small inclines all the way to the turn around, with tree roots, rocks and a couple of small creek crossings in between. I had about 300 metres on Richard at the turn around and he yelled out as we passed with encouragement and he mentioned on passing, his right ankle was stuffed. From my point of view, he didn’t look to be slowing down and I took the foot off the pace slightly to ensure he was still travelling okay, and with regular checks on the way back I could see him at several stages, knowing he was still plodding along. With a kilometre to go I was surprised by a dark brown wallaby who decided to pounce straight across the trail in front of me, in some sort of protest at us running through his home. It took me quite by surprise, only to drive me faster to the finish. Heading into the chute for transition I could see our second runner Jan waiting. We made a lightening bib exchange which would have even made the Formula 1 it teams jealous and Jan was off onto the yellow loop. At this stage only a couple of minutes behind, Richard came through and the extent of his ankle injury was made a little clearer. The effort and adrenaline to finish was admirable as to look at his ankle many people would struggle to walk, but he powered on. Unfortunately, he ended up being the first ever Australian Ragnarian to visit the medic tent and was advised to elevate and ice. This didn’t look good for Team B as it would mean maybe another runner would need to double up. So coach Rachel, got involved as our trained Rachel’s Runner first aider and exercised some intricate taping to assist the load also. By this stage, the day was starting to warm up considerably and both mine and Richard ‘s advice was to ensure that you hydrate up, as the day was going to be long with an expectation that most runners of each team would have approximately 7-8 hours between each run. So, it was extremely important to re-hydrate after each run and fuel up with various foods in camp. Most of the daytime hours were timed like a well-oiled machine in getting to the transition tent to support incoming and outgoing runners with various yells and screams of encouragement. Just before 4pm I was ready for run 2 on the longest loop – the red loop. Mentally I don’t think I was ready, just due to the heat of the day, but never the less, my aim was to get through it as quick as I could for the team. I headed out of the start chute and up a long gentle hill for approximately 1 kilometre, which then dropped down sharply for a quick downhill run. Knowing I was going to be hitting this on the way back played in my mind for a while, as the rest of the trail rolled up and down on a gently sloped trail along the edges of the valley with some picturesque swamped paddocks at the edge most of the way. A nice brief welcome with about 400m to the turn around was a drink station – such a refreshing enlightenment if you had to top up, which I did. Onward the trail continued heading back until that entry hill we had traveled down early on and it was truly “march and squeeze” time. When I reached the top for the reward, it was time to break out the spinnaker and let the legs utilise the gravity of the approximately 1 kilometre gentle downhill to the transition tent to meet the next runner. Run number 2 down and one to go! Time to gather the essentials together to have a shower in one of the six temporary showers located on the back of semi-trailer, small enough that you needed to go out of the shower to change your mind. Ha-ha! The small showers were friendly, where you got to know six new friends, whom you didn’t know faces or names, but hearing and joining conversations over and under the partitions, whilst you battled for warm water (I was lucky I got two warm ones out of three showers) was a new kind of fun! Now, most importantly, it was time to re-hydrate and refuel with the included pasta meal as part of Ragnar. In behind the Transition Tent, was the Mess Hall, which reminded me of a scene out of old TV show 4077 MASH – 3 trays of pasta (meat, gluten free and vegetarian) all with the same light tomato sauce and then a big tray of salad leaves. If you were lucky and nice to the servers, you got two spoonfuls of pasta slapped onto your disposable paper plate. I grabbed a cider on the way back into camp to add some taste to the meal and that was dinner! Later on that night, there was a special surprise visit by Santa briefly, surprising Layla outside her swag, just to ensure that she was sleeping in her impressive animal print onesie sleeping bag. He inspected the camp and then disappeared into the bush, not something you see every day, but it still was 49 days out from Christmas Day, so he was a bit early! It was off to bed early, as many tried to sneak in a few hours of nanna napping in to freshen up for their night runs. The constant ziiiiip-ziiiiiip went through the night as one runner would return and their job was to enter the correct tent or swag and wake the next runner in line whilst one other was out on course. Usually this would wake everyone anyway as the constant fumbling for running gear and essentials for the run was always difficult to find in the dark among the mess of tent ropes, bags and with headlamps shining through into transparent tent linings. My last run came at 11:30 pm-ish Saturday night (with a bit of apprehension) as some team mates had reported the yellow loop to be difficult with a large hill to climb. However, I felt very refreshed and well-fueled and was excited by the challenge of the midnight run. I spent a while getting my lighting right, two bright beams of light bursting out of my forehead to light the path ahead. Out I went once again through the long grass, but after all the runners had trampled over it all day long, it was actually clearly defined with two nice in and out trails to the yellow and green separations. This was a pleasant surprise and set me up nicely to high five Rachel on her way back in from the 8 kilometre loop, filling in for Richard as Runner 1 on Team B. The yellow loop trail had a great mix of everything – nice small inclines with a small downhill reward and then some nice flowing flat trails; it looped out and then back into the steep hill, very much resembling one of our local Sydney training spots – The Needles in Barden Ridge. I must say it wasn’t fun when you got to the top, as you just rounded the gate and came back down – made you question “Why the hell did I run up there?”. Anyway, the trail meandered on to the finish, crossing some fallen trees and minor creeks. This loop was probably my most favourite of the three trails; satisfying to accomplish when you give it all you had left after a long day of running and even more special at night. In I went to transition and Jan took off into the darkness of the night for the red loop and we continued on through the night, transitioning through our runners. In the early hours of daybreak, our lucky Captain, Sheree was so fortunate to be on course doing the yellow loop when the awakening rain hammered onto the tents and campsite for those hiding underneath. Rain becomes quite loud when there is just nylon and yourself between the state of being wet too! Out on course it was a different matter as Captain Sheree had to battle the short sharp hill on yellow loop with rain tumbling down. The picture we could paint was more like swimming a waterfall uphill, with a little mud thrown in. Meanwhile, whilst we were awaiting Sheree in transition, Team B had brought their Ragnar to a close with Captain Layla coming in from the fresh shower on the red loop, to gather the team and collect their trophy of medals. An awesome effort by them, with Michael and Rachel having to complete an extra red and yellow loop to cover off for Richard who was only just able to hobble to the finish to celebrate the completion. With Troy our last runner out on the red loop, we knew we had approximately 60 minutes till he returned, so it gave Team A time to assemble near the finish and be able to coast in together. But, we had to do a double take as Troy sped past us like a man possessed, determined to beat another runner in to the finish who had recently passed him on the hill. So finish he did, bringing home Team A and then we did a casual run in together as a team; a very satisfying experience to have as a team pushing each other and ourselves for just a tick over 24 hours. We collected our combined medals and became Ragnarians. Sore legs don’t last, but memories do. S’Mores and adrenaline can get you through anything. There is a badass inside all of us. Together we can Ragnar, together we can do anything. Campfire makes the best cologne. Sunsets are better when shared. Mud and dirt are good for the soul. A big hearty, loving thank you must go out to everyone in both teams for their co-operation and involvement and most of all the fun weekend had by all. It was very memorable. Also a big special mention to Megan in the A Team, with the brand new tent, luxurious accommodation, the camping experience knowledge and all the gear trucked in. The tireless work on sourcing and design of the A Team shirts and not to forget the absolute enthusiasm that was infectious within the Team. Thank you Megan.